In my last post you found out all about stuttering in pre-school children in general. What does it sound like? When does it start? What are the risk factors? And most importantly, what you can do when your pre-schooler starts to stutter. You can read it here. The 10 Dos and Don’ts in the post apply to everyone. This week’s post is about stuttering when your child speaks more than one language. This is a complex topic! Stuttering is an intricate problem to understand and treat no matter how many languages you speak. The research is very limited. It’s hard to find definite answers for families who speak more than one language. Speaking more than one language and the risk of stuttering is still being debated in the research. 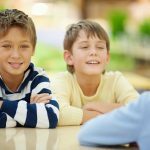 No studies in the last 16 years have actually focused on the frequency of stuttering in non-Western cultures and it’s not clear why. There’s been little progress in the research about stuttering and speaking more than one language. Right now, in the existing research, there isn’t even basic evidence to support or contradict a claim that speaking more than one language puts your child at risk for a stutter. Remember that fact if a health care professional tells you otherwise. The evidence either way just isn’t there yet. (I’ve put the research I read at the end of the post for you) There’s no justifiable reason for suggesting that a child who begins to stutter should drop a language. Language is for communication, emotion, family, and relationships. And dropping a language is not the answer. The Stuttering Foundation (a U.S.-based not-for-profit organisation) says that no evidence has been found to suggest that speaking two languages in the home since birth causes stuttering. Colin Baker (a well-respected author on bilingualism) says the same thing. The Stuttering Foundation also says that there’s no indication that teaching your child a third (or 4th etc.) language causes stuttering. Additional languages are often introduced around age four, which can be a critical age for both language-learning and stuttering. Now they also say that if you notice that your child’s language isn’t developing as expected or you notice the beginning signs of stuttering, you do need to see a speech and language therapist. They mention holding off on the introduction of an additional language in these case until after age 6. But if your child needs 2 or more languages to communicate, then holding off may not be an option. People who speak more than one language and stutter, including pre-schoolers, tend to stutter in both of their languages. Stuttering might happen a little more in the less-developed language. As competence in the less developed language increases, stuttering usually disappears. So in the face of all this mixed information, what should you do? I think it’s a good idea to consult a speech and language therapist who specialises in stuttering. Find out what are their approaches to treating young children who stutter. If they tell you to drop a language that your child needs to function in their home, school, or community, don’t do it. While you’re waiting for an appointment, use the 10 Dos and Don’ts in my last post which you can read here. Multilingual Aspects of Fluency Disorders (2011) edited by Howell and van Borsell. Yairi, E. & Ambrose, N. (2013) Epidemiology of stuttering: 21st century advances. Journal of Fluency Disorders 38(2): 66-87. Description of multilingual participants who stutter by Geoffrey A. Coalson∗, Elizabeth D. Pena˜ 1, Courtney T. Byrd2 Journal of Fluency Disorders 2013 38:141-156. Vonga, E.,Wilson, L. & Lincoln, M. (2016). The Lidcombe Program of early stuttering intervention for Malaysian families: Four case studies. Journal of Fluency Disorders 49: 29-39. Schenker, R. (2011). Multilingual children who stutter: clinical issues. Journal of Fluency Disorders 36: 186-193.